I almost missed this film - last time S picked this over another one, and I'm glad we haven't missed it! 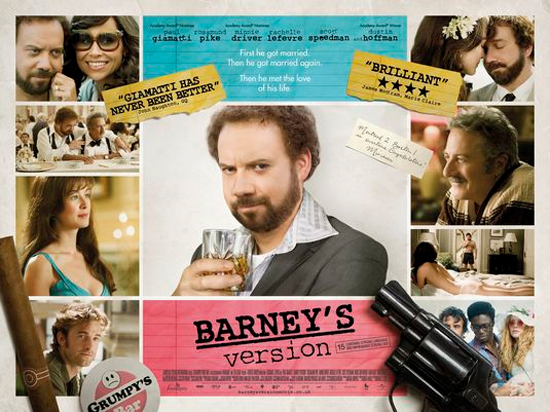 Barney, a below-average looking man who's been married 3 times, who falls in love with his third wife at his wedding to his second wife - what would you think of him? But he's just so lovable in the film and you feel for him, even when he makes the deadliest of mistakes. It's also important to note that, despite his 3 marriages, he's only really fallen in love once - with his third wife. Despite his weirdness and his infidelity (due to loneliness and being upset because his wife has left him for a few days and is going to see a possible 'rival'), you feel really sorry for him, especially towards the end. I like in particular his conviction that he will grow old and die with Miriam, his real love; he even buys a cemetery plot for himself and Miriam, and that happens when she's away for the few days and he misses her. At the end of the film we see that he is really buried there, with Miriam's name engraved next to his. The father-son relationship portrayed is really touching too. Barney's dad, played by Dustin Hoffman, is at times embarrassing, and like father like son, Barney's inherited that trait from him. They're really close, and that is really heart-warming. The father never questions the son's decisions, though he knows it when something is not working out, and they're more like best friends than anything! So nice. Rosamund Pike who plays Miriam (Barney's third wife) is very pretty, though her character is not particularly likeable. She's too serious, too 'normal' - the only time she's not normal is when she accepts Barney, and that moment's a bit awkward actually. But you can so see why Barney falls for her and remains in love with her throughout. She just has that mesmerising vibe! Gorgeous both young and aged. :) S thinks the young Miriam looks a bit too old, but I like her kind of classy beauty, and like what Rosamund Pike says in an interview, if you're pretty, when you age the wrinkles fall in the right places. Nice way of putting it, and very true!